This 32 oz. 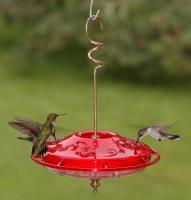 Feeder from Best-1 is a best-selling favorite of our customers and is found in yards and gardens across the world. The Best-1 32 oz. feeder has all of the best features of the original: durable glass and hi-impact styrene construction with a countersunk insect-proof 8-port base. Easy to fill, and with a hefty 32 oz. capacity, you won't have to bother with refilling it all the time. A convenient perch around the base of the feeder also comes off for supremely easy cleaning and filling! Proudly made in the USA! Why mess with the rest, when you can have the Best-1? I have bought many hummingbird feeders in the past, but this is truly the best one I have ever bought. Because of the way the base comes apart it is very easy to keep clean for the birds. The quality is excellent. I highly recommend this product! 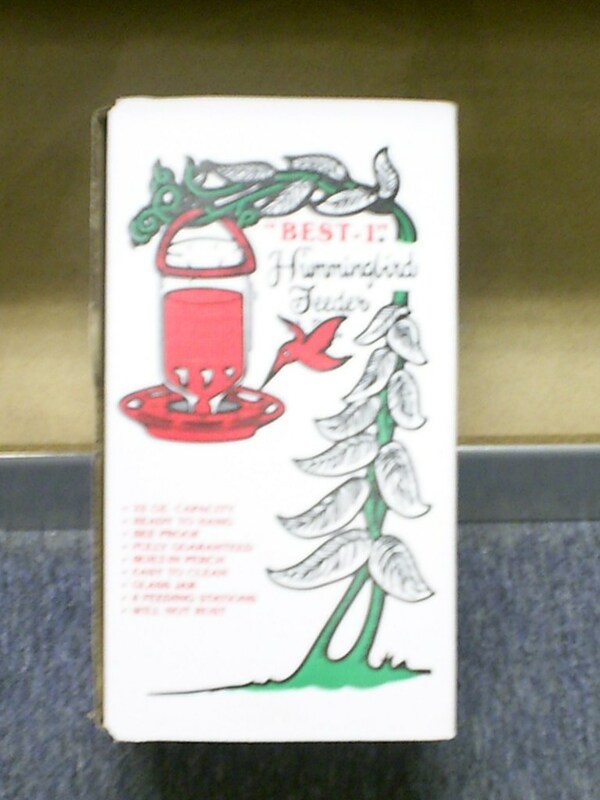 This hummingbird feeder is easy to fill and clean and the quality is excellent. Works great had birds using it with in days of hanging it up. Also believe the bird nectar product I bought with the feeder contributed to its success. We bought a similar feeder in Tucson last year and then ordered 2 more when we got home. While the initial cost was not unreasonable (CAN$45) when adding the freight (CAN$40) and import duty/brokerage (CAN$30)made the total completely unreasonable. While I am happy with the product I would not have proceeded if I had realized what the total would be. As a result, I would not be prepared to buy anything else from you and I would not recommend you to others. I absolutely love this hummingbird feeder. I don't have to fill it every other day and my birds love it too. The other day I had 4 hummingbirds feeding at the same time. I have it off my front porch and I can go out there and watch them feed. They're not afraid of me at all. So much fun! I've tried many different brands, from Perky to Dr. JB's, and none compare to Best-1's tried and true design! - Hummers like it. - Easy to clean and replenish. - 32 oz. capacity is perfect for the high season! We now have two of these and, if we have to get another, it will also definitely be a Best-1! I bought one of the hummingbird feeders, then liked it so much I bought two more! I have two side by side and have lots of places for the hummingbirds to feed. I usually have about 10 - 12 birds a once!! I love the jar, it's easy to fill and holds a lot! The hummingbirds and flickers love it! I own this model and love it so much I bought this one as a gift. Hummers need to rest while they eat. They stay longer and it's better for bird watching. 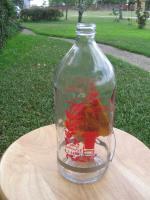 The glass bottle is best for sanitizing and the plastic parts are durable for cleaning. I use this summer and winter. The larger capacity allows me to add more in summers. The red color attracts them and there is no need to dye the sugar water. It is easy to see when the level gets low, even the hummers look at the nectar level! This model will provide years of enjoyment. This is one of the best hummingbird feeders available. It is easy to clean, holds a lot of food, and the hummingbirds like it. The bees and hornets stay away because the holes are flat. Other birds stay away for the same reason. Love that it keeps the bees away!! It's like the "Cheers" bar for hummers! It isn't the prettiest but when my neighbors see all 8 holes occupied and more waiting, they are amazed. The best of the many hummer feeders I've had. Much easier to clean than others but still a chore. Wish it was dishwasher safe. I am so glad I found this one online! It was sent to me as a gift and I wouldn't have any other hummingbird feeder! I know several people who have tried the hummer feeders who complain about bees, etc. All we have is hummers tactical over it. What a thrill to watch! I love the feeder. It doesn't drip attracting yellow jackets!!! The yellow jackets try to get in it but aren't able to. Wonderful!!! 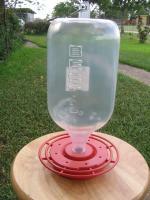 This is the "Best 1" hummingbird feeder I have ever had! I used to find the yellow flowers missing on occasion from another brand and had trouble cleaning the base. This feeder's base comes apart for simple cleaning and has no plastic flowers to clean, lose or break apart! I have 6 of these and won't change brands again! This is the best humming bird feeder for attracting large numbers of birds and does not require refilling except during fall migration time. I have had these feeders for several years and had lost a source for securing them locally. 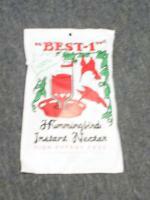 These are great feeders--the hummingbirds love them. They are sturdy, too, because they withstood a bear! My only issue is cleaning them. You need a bottle brush to get inside. It does the job. The birds seem to like it. One of the glass jars used to hold the nectar slipped out of the metal holder the first time I hung it up. I only bought this as it was described as "bee proof". It is chuck full of bees!! More bees than my other feeders. Very disappointed. Plus the cost of shipping was almost as much as the feeder that does not live up to its claim.